During the Purton Hulks Open Day on Saturday 17th July, Paul Barnett challenged Slimbridge Dowsing Group members in front of a large group of visitors, asking them to dowse how many crew were on the “Catherine Ellen” the day she was beached 58 years ago. The Dowsers had again been invited after their success last year at finding several hidden wrecks (see "Dowsing The Purton Hulks" on our Events Reports page). Members Peter Gibson and Barry Goldring arrived early and attached the Group’s new banner to a nearby hedgerow, always a challenge even in the slightest breeze. They then got down to business and marked out the location of a couple of hidden hulks. Paul Barnett came along with the visitors, and invited Peter Gibson to explain his methods and how he had dowsed the outline of a hidden vessel. The visitors were fascinated. Further along the path, Paul and the visitors came upon Dowsing Group Chairman Peter Golding, near the spot where he had previously identified the “Katherine Ellen”, a buried hulk whose location Paul Barnett was anxious to have confirmed. Peter showed the group how he dowsed the outline and walked round it following directions from his dowsing rod. It also indicated that the wreck was almost three feet below the existing surface. Contact Paul Barnett at Friends of Purton on or telephone 07833 143 231. 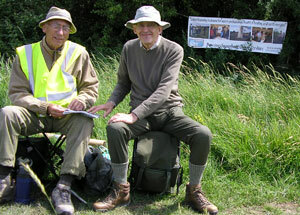 Peter Gibson (left) and Barry Goldring take a break after dowsing hulks at the Friends of Purton open day on the Gloucester & Sharpness canal. 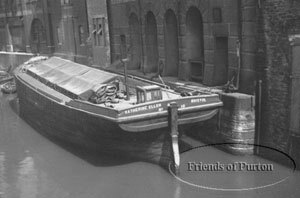 Katherine Ellen wood Lighter ex Sr 1862 Waterford at Redcliff Back 10th April 1947 The Graham Farr Collection (Sm 406). 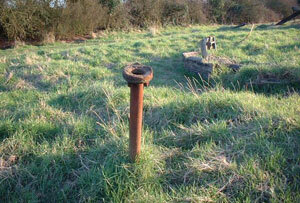 Photo reproduced from The Friends of Purton website. Katherine Ellen. All that remains 12th April 2004 The L. P. Barnett Collection. Photo reproduced from The Friends of Purton website.